Born and raised in Hollywood, CA, Yuji Okumoto began his acting career over 25 years ago. After graduating from Hollywood High School, Yuji attended Cal State University in Fullerton, where he took his first acting class. While performing in the Arthur Kopit play Indians, he was approached and signed by an agent. His first acting job was on the CBS soap, The Young and the Restless. Yuji’s first big screen break came in 1985, when he landed a part in the film The Check is in the Mail starring Brian Dennehy and Anne Archer. Other early films were two classic 80’s teen comedies . The first being Real Genius where he played a nerdy sidekick to Val Kilmer. Better off Dead came next where he badgered John Cusack with a hilarious Howard Cosell imitation. 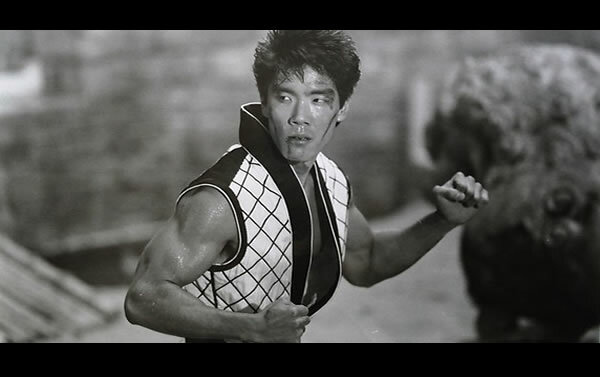 Yuji’s breakout role came in 1985 when he was cast to play Ralph Macchio’s nemesis in The Karate Kid, Part II. His role as Chozen is a classic bad-guy role that people to this day still love to hate. In 2006, Yuji had the privilege of reuniting with his Karate Kid, Part II co-stars & friends, Pat Morita and Tamlyn Tomita for the World War II film Only the Brave which now holds the distinction of being Pat Morita’s last film. In the summer of 2008, Yuji wrote, produced and starred in an action packed short film, Katana. The film also starred Yuji’s close friend, John Koyama, who is known for his stunt work in The Book of Eli and the upcoming film, The Green Hornet. Yuji has worked on over 30 films, and made over 30 television appearances. His feature film credits include, Pearl Harbor, Johnny Tsunami, American Yakuza, Contact, The Game, The Truman Show, True Believer, I’ll Remember April, The Crow-Wicked Prayer, Big Momma’s House 2 and Mask of the Ninja. Recent TV appearences have been in the hard-hitting CBS series The Unit as well as the long running Fox hitBones. You can see Yuji in his most recent film, the blockbuster summer hit of 2010Inception where he worked along side Ken Watanabe and Leonardo DiCaprio. Yuji currently resides in Seattle, Washington where he owns and operates Kona Kitchen with his wife, Angie. Kona Kitchen was inspired by his years spent visiting friends and family in Hawai’i, including his uncle who owned a Hawai’ian style restaurant. Yuji insists upon mantaining a strong family atmosphere in his restaurant which is evident by the way you are treated here. When Yuji isn’t off making movies, you might catch him hangin’ loose in the restaurant. He always makes time to talk with customers, pose for pictures or possibly even block a crane kick! Yuji and Angie have three beautiful daughters, that are their pride and joy.